To outline or not to outline .... ahhh, as writers, that is the question. In my opinion there is no right or wrong way to set up or prepare for writing a novel. Or how you actually write it. For one thing, each storyline, each set of characters, demands different approaches. After saying that, I admit ... yes, I am an "outliner". I always use an outline of some form or other when I write a novel. "An outline is usually in the form of a list divided into headings and subheadings that distinguish main points from supporting points." This is fine if you are doing an essay for university or high school, based on research etc., but the creative act of writing an entire fictional novel is much more complex than this, and the creator is forced to keep a lot of balls in the air -- that can come crashing down -- if they have not in some way organized how to keep those flying balls in order. An outline can do that for a writer. How you construct a functional outline and still maintain the freedom to be free to change events and develop characters can vary a lot, from notes on cards to chapter by chapter outlines and many varieties in between. You do what works for you to get from the first word you write down to the very last word. I usually begin an outline after I've written my first few chapters, with a simple chapter by chapter format written in point form - adding a few sentences under each chapter heading, which indicate or remind me what might be the action and character interaction in that chapter. Open to revisal at any time. I never type it out. I always hand-write it in pencil. That way I can chew on my pencil and think ... and scribble ... and erase and think some more! 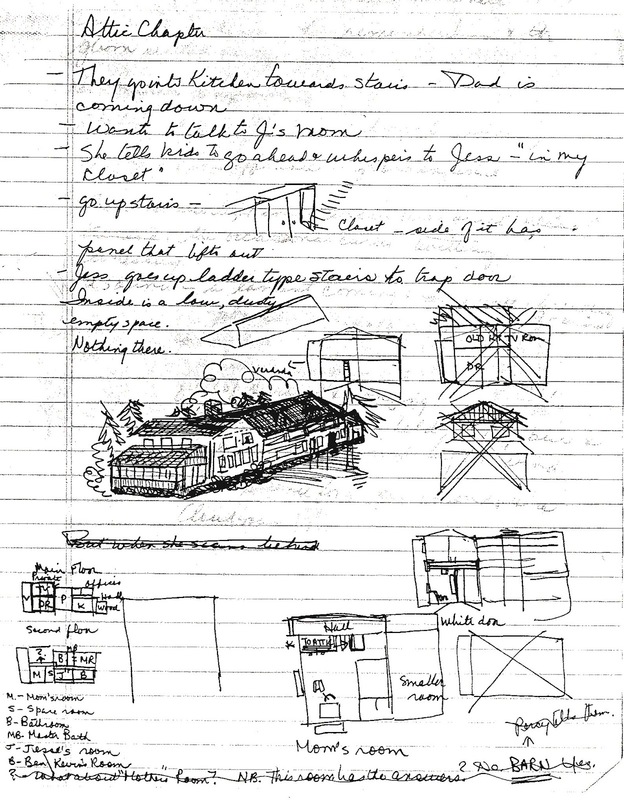 Below is the first page of the first outline for "Who is Frances Rain?" I started this outline for "Frances Rain", after I got stuck around the middle of chapter three, because it was my first book and I didn't have an outline set up. When I stalled, I thought, where the heck am I heading? No idea. Maybe a vague notion. But how to get there? I had never taken a writing course, but it seemed to me to be a sensible idea to form an outline of sorts in order to control and organize all of the myriad thoughts, characters and scenes swarming around in my head. So that is when I created the first outline page, above, followed by many others. If you have begun your novel and become stuck (some people call it writer's block...) try an outline from wherever the block stopped you. Just as an exercise. If you are about to start a novel and you have a pretty good idea what kind of book you want to write; a vision of your characters; a setting; and a general plot idea; sit down and try to work out a chapter by chapter outline of the movements through the story. You'll soon know if an outline works for you. Most novice writers appear to want a magic method handed to them that will allow them to get a novel written with the least amount of angst and time - and the most amount of creativity. They want someone with lots of experience to give them the answers to the quickest and most efficient way of writing a novel and to also offer easy ideas that will allow them to somehow magically write better because of it. An outline is not going make that happen. But it can help you work through a story idea, on paper, that will allow for flexibility, movement, change of mind ... and if nothing else, it will force you to deep-think about your plot and characters. An outline can be extremely detailed (see some of the quotes below) so that all you have to do is flush out the details when you write the novel. Some writers do outlines so detailed it is almost like a first draft. (Unlike my own lean outlines.) It's up to the writer. You do what works for you. As I said, I go for a very basic and simple outline and work through the story chapter by chapter. These first "chapters" are only a loose guide and may later be divided into two or or more chapters or I may have to join two chapters together depending on how the writing goes. I will also put a * symbol beside an important scene in those notes - and will often even write the actual scene on the back of the outline page or in a notebook - usually again with a pencil while my thoughts are fresh. That scene may or may not end up in the story. Here are some of the things I think about when doing my chapter by chapter outline. On the outline below for "Winter Shadows", I made notes and added a few extra ones about weather etc. As this novel takes place in the present and the past in the dead of winter, the weather and the setting are used very specifically to set mood. I always mark down what day it is, Monday, Tuesday night, etc -- especially if I am going to have my story take place in a very limited time. Of course, my first goal is to always tell a compelling story. But that can't happen without strong characters, and I never stop thinking about how they are feeling, and reacting, to what is happening. And my notes reflect that always in my outline. I still write the first few chapters of a new book without any form of written framework, and then sit down and work out a path for the rest of the novel, knowing full well that this will certainly not be the only path I take in the development of the story. If my characters at some point refuse to go the way I am heading, then after some thought, I am usually willing to veer down the branch in the road where they seem to want to go. Sometimes I even start an entirely fresh outline or else I stretch the existing one to add new events. This year, after trying to write my 11th novel without an outline, (as an exercise!) my creativity dried up because I had no idea where to take my characters and they couldn't give me any hints. We were all stymied. So I am now working on the outline for it - and it's moving along pretty well. Clearly this is how I work. If you are writing a 300 page novel with many chapters, chances are you're using an outline in some form or other whether you realize it or not. As I said previously, outlines come in all sizes, shapes and forms. Some are nothing more than notes to yourself. Using an outline, for me, isn't restricting, but freeing. And it keeps me from having to do huge rewrites. My outlines can, and do, morph and change in many ways through the writing process. They are always fluid, allowing loads of room to manoeuvre. Here is an example of my novel Winter Shadows' first general outline. As I was planning to do alternate chapters between a modern young woman and another young woman living in 1855 in the same house, I had to plan how these two people interconnected in order to kind of "mirror" each other somewhat through time ...but at some point I also knew that they would actually meet each other. It was pretty tough to organize. Can you tell? Imagine if I'd winged it and not figured this out before I started? For me.... utter chaos! After wrestling with this, I could then work out a chapter by chapter outline, and each young woman got to tell her story. A number of well known writers use outlines, but just as many claim they wouldn't touch an outline with a ten foot pole. One of the reasons some people give for not outlining is that they believe that their characters will evolve more "organically" if they don't use one. Others claim that outlines take away the mystery of the story and it becomes very boring for them to write. They also feel that the freedom to allow the story to develop on its own is crippled. If a writer hasn't outlined a novel before, I can definitely see them assuming these things are likely to happen. But it seems to me that they are seeing an outline as the entire novel set out in point form, so all the secrets are out and they have nothing left to "discover". It is not like that for me at all. My outlines are lean point by point frames on which I can eventually weave my story in full colour. This allows for the characters, tensions, plot, and that thread of electricity I need to drive the story to develop in a natural and exciting way for the reader (and me!). 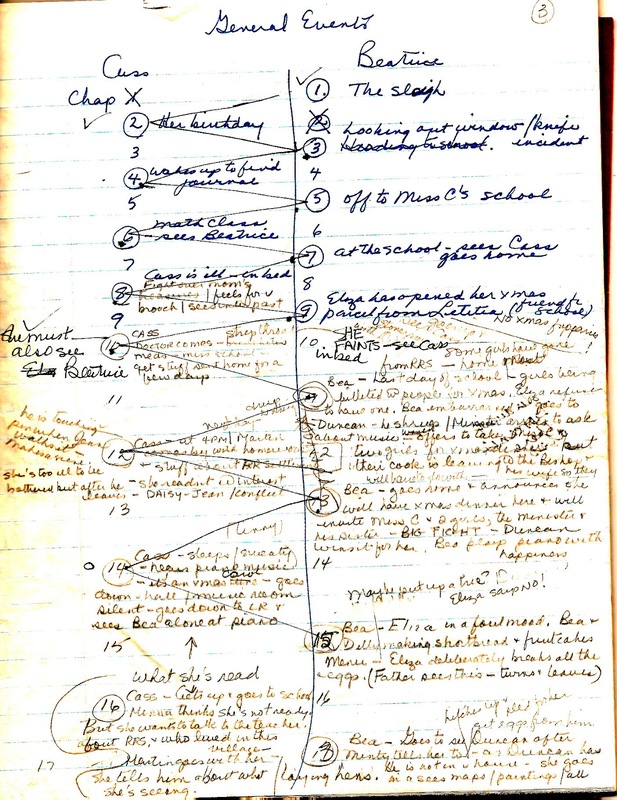 Here is another form of "outlining or planning for a novel". It is a (bad) drawing I did of the ranch house for my book, "My Mother's Ghost." I had my characters moving around this vital space as I was writing, but half the time I became confused because I didn't know the layout of the house except in my head. So I decided to "build" a quick sketch of the ranch house and its floor plan. As it happened the plot changed, but the final lay-out of the floors that I decided on (bottom left) really helped. The thing I've discovered in researching this topic, is that writers seem quite willing to take a stand when it comes to outlining. 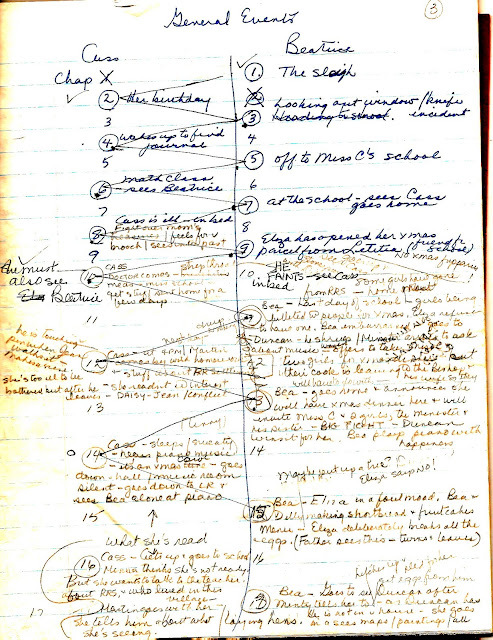 When F. Scott Fitzgerald was working on a novel, he surrounded himself with outlines of plot and the backgrounds of his characters. He immersed himself in the outline to the point of working out all the details before hand. Invent a system Zolaesque (in the style of Emile Zola) …but buy a file. On the first page of the file put down an outline of a novel of your times enormous in scale (don’t worry, it will contract by itself) and work on the plan for two months. Take the central point of the file as your big climax and follow your plan backward and forward from that for another three months. Then draw up something as complicated as a continuity from what you have and set yourself a schedule. inside a scene can be different from the view outside it. I am far more disciplined than that. The research is the easiest. The outline is the most fun. The first draft is the hardest, because every word of the outline has to be fleshed out. The rewrite is very satisfying. because you've already done the work to push through those kinds of blocks. There's an outline for each of the books that I adhere to pretty closely, but I'm not averse to taking it in a new directions, as long as I can get it back to where I need to go. Justin Cronin. If you do enough planning before you start to write, there's no way you can have writer's block. I do a complete chapter by chapter outline. For all my longer works, for example novels, I write chapter outlines so I can have the pleasure of departing from them later on. I'm a great believer in outlines. The outline is 95 percent of the book. Then I sit down and write, and that’s the easy part. Hone your outline and then cling to it as a lifeline. You can adjust it in mid-stream, but don’t try to just write your way into a better structure: think about the right structure and then write to it. Your outline will get you through those periods when you can’t possibly imagine ever finishing the damn thing — at those times, your outline will let you see it as a sequence of manageable 1,000 word sections. And here are some writers who are "anti-outline"
Because I don’t work with an outline, writing a story is like crossing a stream, now I’m on this rock, now I’m on this rock, now I’m on this rock." So I made an outline. Well, you know, days are going by, and I am not writing anything because this thing is laid out in front of me. It's as if you get every brochure for a trip you are going to go on and you get the minutest details of every step along the way. Well, I really doubt you're going to then get in the car and go. You know, it's like, why bother if it's all laid out in front of you? I don't plot the books out ahead of time, I don't plan them, I don't begin at the beginning and end at the end. I don't work from an outline and I don't work in a straight line. Final comments: An outline allows me to know a direction that might work better than others and keeps me from having to do multiple rewrites - and it also lets me know that, although I never know for sure the ending to my story (I like to be surprised, too!) I will get to the end without getting out of control - or bogged down in a muddy path that is leading me nowhere. But if you work better without an outline and have had success in publishing - or at least finished a novel to your own satisfaction, who am I to tell you that you're wrong? 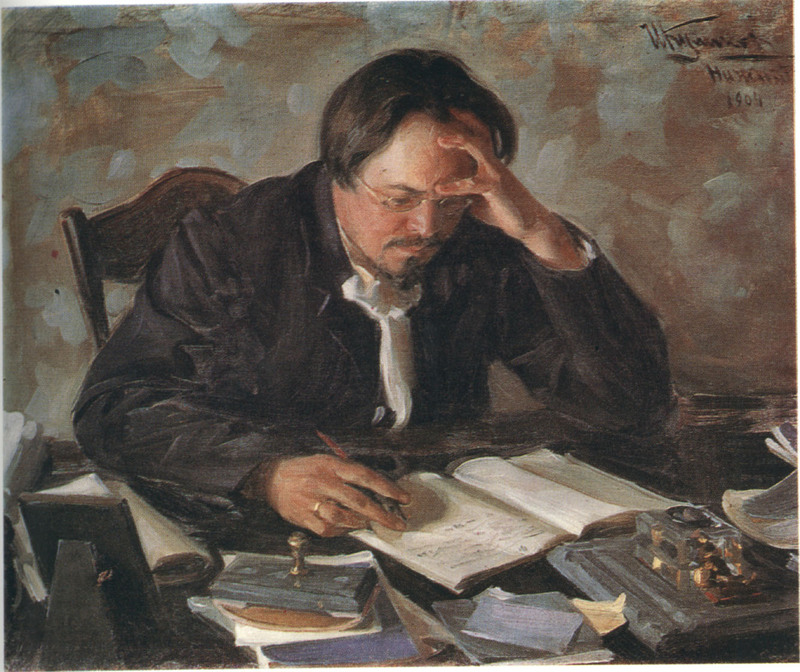 This painting reminds me of how it feels to work on a novel at any stage of it. It is one of the few paintings, I think, that captures the mood we all find very familiar! I like to think he's working on an outline! I just saw this link posted a few days by my facebook friend, Linda Granfield who I featured in a recent blog on children's writers. More outlines! And the first I've seen online. Fascinating post which I will read again more closely when I have more time. And will send you a screen shot of my 'reverse outline' sheet for yet another view of the process. That would be great, Lois! I look forward to it. So you do use an outline of sorts but after a first draft. That makes sense. I start off barrelling through three or four chapters (like priming a pump!) then I stop and begin my charting and time-lining. The same but different. Love to hear writers' different approaches. Yours obviously works for you! Love that you enjoy Frances Rain!